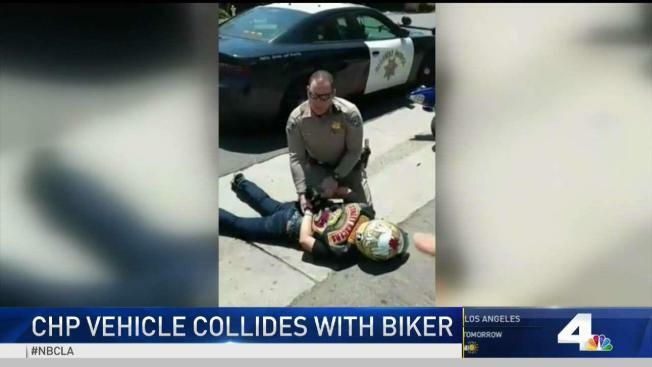 A biker was knocked off the road Sunday by a California Highway Patrol vehicle, and the incident caught on camera has caused outrage in the motorcycle community. Over the Memorial Day weekend, a large group of bikers took the road and went for a ride on the 210 Freeway. A CHP vehicle seemingly picked out one biker and attempted to pull the rider over. Raul E. Garcia Martinez of Los Angeles was the biker who ultimately got knocked off his bike when his motorcycle came into contact with the CHP car. 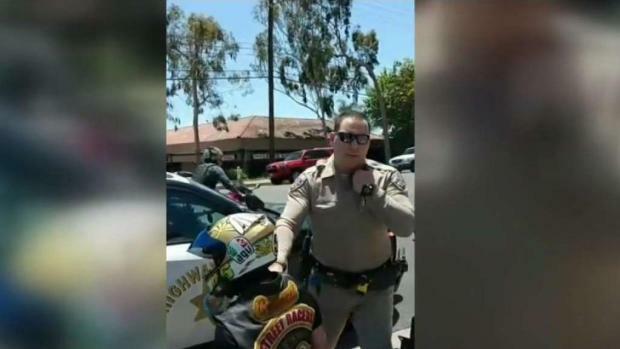 The CHP officer, who was not identified by name, handcuffed the rider under duress of a several other riders who thought the CHP officer had acted too aggressively with his vehicle. According to CHP, Martinez yielded to the right shoulder then quickly accelerated before the crash. A biker charged with evading arrest is seemingly run off the road by a CHP vehicle. Ileana Diaz reports for the NBC4 News at 8 p.m. on May 28, 2018. "For unknown reasons, the left side of the Yamaha made contact with the right side of the patrol vehicle on 19 Street, west of Carnelian Street," CHP said in a statement. Martinez received minor injuries and was transported to a nearby hospital for medical treatment. He was charged with felony evading.